Designed to save space but always ready, the PIXMA TS6120 is packed for performance. 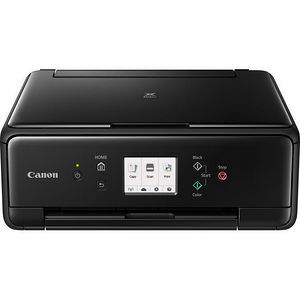 With all the connectivity you'd expect like AirPrint, Google Cloud Print, and Wi-Fi it also has some higher end features like Bluetooth5 and Cloud Printing6 capabilities. Some of your favorite features, like Auto 2-Sided Printing - which helps you save up to 50% of your paper costs, have gotten even better with features such as 2 way paper feeding. With 2 ways to feed paper, the front paper cassette is always ready to go at a moment's notice and also a rear paper tray that can be extended for when you need to print more. A 5 Individual Ink System can help you save money, as you only need to replace the ink that runs out! Scan important documents right to your smartphone using the Canon PRINT app1 so you can share them right away. Print, copy and scan quickly and easily with the 3.0" LCD Touchscreen. Find & select what you need on the intuitive user interface. With Bluetooth5 & Wi-Fi4 built in - connecting your smartphone, tablet and all your other devices has never been easier. Just choose the right one for you and print! From documents on plain paper to high-quality photos the PIXMA TS6120 has you covered. With both Front & Rear Paper Support load the paper you need with peace of mind. With Auto 2-Sided Printing you can print on both sides of the page, this helps you save up to 50% of your paper costs.